This was an oddly entertaining novella. I must admit when I read that it was dealing with taxes the first thing I thought was snore but it really wasn't that bad. 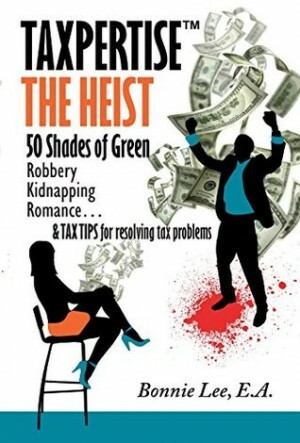 It even gave nifty tax advice after the chapters so it was almost an educational read. It was pretty easy to get into because it was so fast paced and full of adventure. I think most people would really enjoy reading this and be glad that they read it. The characters were great especially Kim, I really liked her part best of all. Luke was kind of annoying to me, the constant phone calls wanting to her whereabouts was annoying and clingy. I understand it was just because he cared about her though so it was easy to ignore. The constant POV change was a little weird. One chapter it would be in 3rd person then it would be in first person, and it kept changing from past to present. That was just weird for me to get used to. I knew something bad was going to happen to Kim - without reading synopsis - I just knew it was coming. The author did a good job making me interested in something know one really likes and educating me at the same time.